Adriana Cazorla used to live in the shadows. The 41-year-old domestic worker suffered from domestic violence at the hand of her then-husband, but felt she couldn’t seek help because of her undocumented status. She was in her “lowest moment,” she told NBC News through a translator, when a woman from her local YWCA approached her. Along with Immigration Advocates Network, We Belong Together — a campaign co-anchored by the National Domestic Workers Alliance and National Asian Pacific American Women's Forum — hopes to provide just that with a new website: Step Forward, which launched Tuesday on International Women's Day, aims to provide the approximately 5.2 million undocumented women and their families with the resources to understand their rights. Andrea Cristina Mercado, co-chair of the We Belong Together campaign, told NBC News that the website is available in both English and Spanish, and that she hopes to expand it to other languages. Step Forward will also keep its readers updated on the status of immigration cases in the Supreme Court, as well as inform immigrants of already-existing programs. In addition to providing information, the website serves as a platform for immigrant women to tell their stories. In a presidential election cycle that’s been marked by anti-immigrant rhetoric, noted Mercado, this is particularly important. Cazorla, who is now an active advocate for the rights of immigration women, said she believes Step Forward will be a source of hope for many women like her. 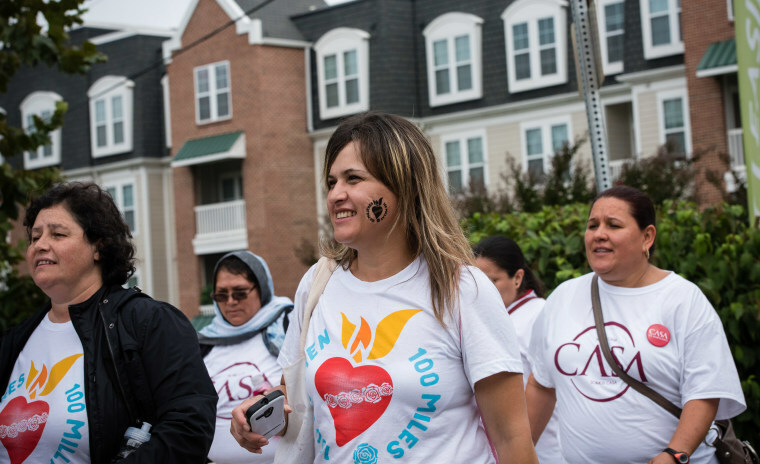 “We’re fighting against domestic violence and to make sure that immigrant woman, particularly who are living in the shadows because of their immigration status, know that they’re not alone,” she said. “We’re with them, and we’re fighting to stop this cycle of victim-hood and to win stronger rights for all of us." Correction: An earlier version of this article stated that the We Stand Together campaign is co-anchored by the National Domestic Workers Alliance and the Immigration Advocates Network. The campaign is actually co-anchored by the National Domestic Workers Alliance and the National Asian Pacific American Women's Forum.